Do You Come Across As Needy? This sense of desperation undermines our goal which is to communicate our competence in a calm, relaxed manner. The lesson here is, even if you want something desperately, you have to remind yourself that not getting it does not define you. You must remind yourself that your entire life does not hinge on this one moment. While it may feel like it is the very end of your life if you are rejected, the truth is it never is. It is this mindset that is critical to adopt before high stakes situations. The sense that it would be great if I got this opportunity is perfectly fine. However, the sense that my life will be ruined if I don’t is counterproductive. So next time you are going for an important job interview, giving a presentation or simply having a conversation with someone you perceive to have more power than you, remind yourself that all of life does not hinge on this one moment. Nadia Bilchik, President of Greater Impact Communication, is an internationally renowned television personality, communication and professional development training expert, author and keynote speaker. Nadia has anchored and hosted feature programs for CNN International, CNN Airport Network and MNet Television (South Africa) and reported for CNN Weekend. Nadia is currently Editorial Producer for CNN’s Weekend Morning program. Want to Meet Nadia? 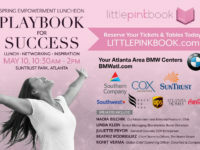 Join us for PINK’s Spring Empowerment Lunch. Let’s meet at the beautiful SunTrust Park, where we will have the opportunity to gather as career women and connect with like-minded professionals, plus more!